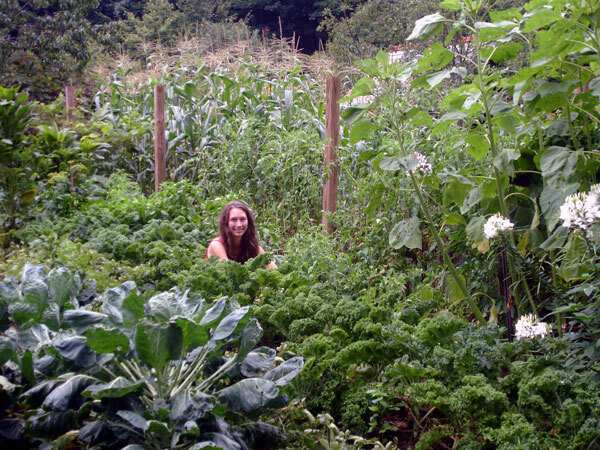 The Humanure Handbook - Basic instructions for making compost from humanure. The Humanure Handbook is also available as an E-Book! Although most of the world's humanure is quickly flushed down a drain, or discarded into the environment as a pollutant, it could instead be converted, through composting, into lush vegetative growth, and used to feed humanity. 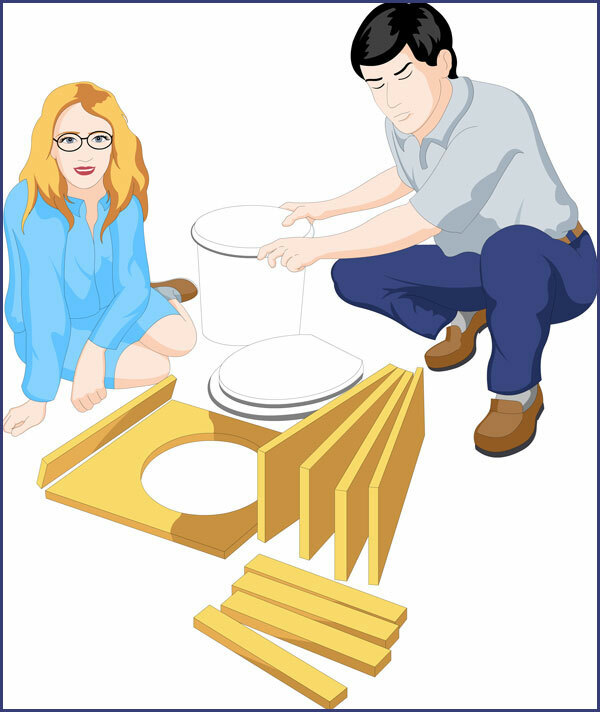 First, construct or purchase a humanure toilet, and take a look at some owner-built toilet designs and owner-built compost bins. 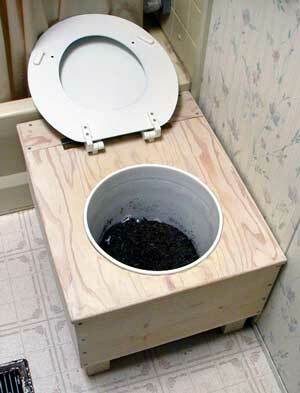 Read the Humanure Compost Toilet System Instruction Manual. 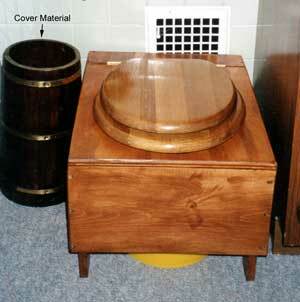 The humanure toilet is a collection device. It is best located indoors. 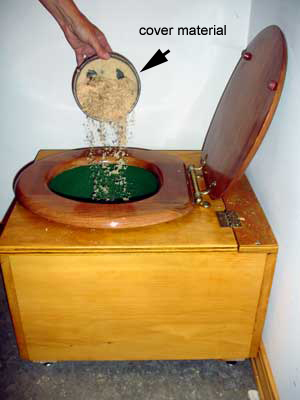 Sawdust (or other suitable cover material) covers the contents of the toilet, thereby eliminating odors, adding carbon, and absorbing lIquids. 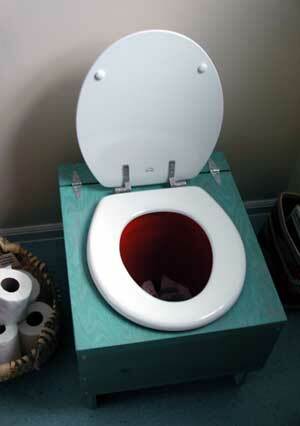 The toilet container should be easily removable. The toilet materials are taken to a compost site. 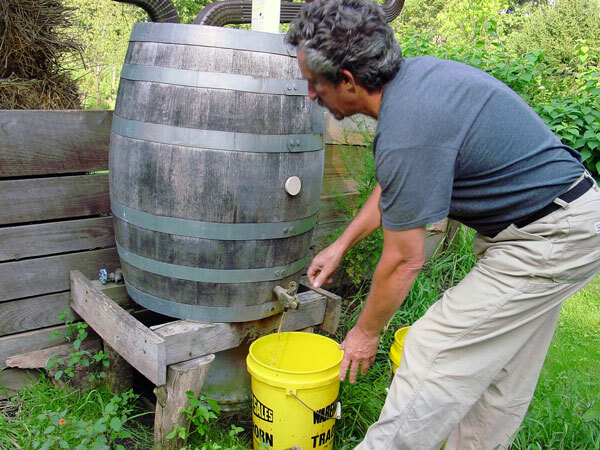 A four-receptacle system should require emptying about once a week for a family of four when each container has a five gallon or 20 liter capacity. When the containers are full, they're set aside (with lids) in the toilet room or other suitable location. They should never be allowed to freeze. 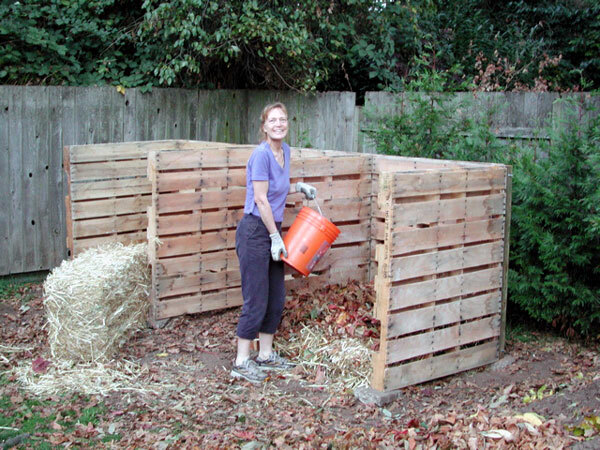 Below is an inexpensive and easy-to-build three-chambered compost bin made from pallets. 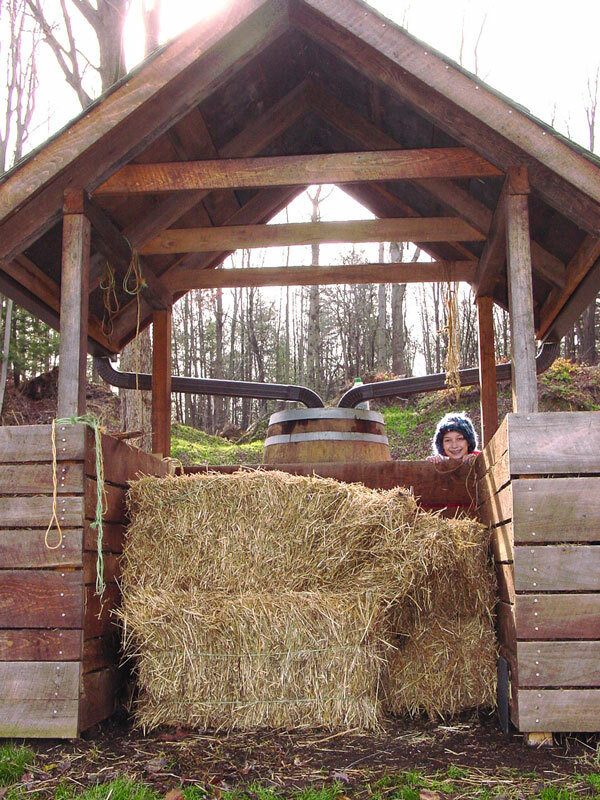 The straw bale can act as a temporary fourth wall for the active bin. 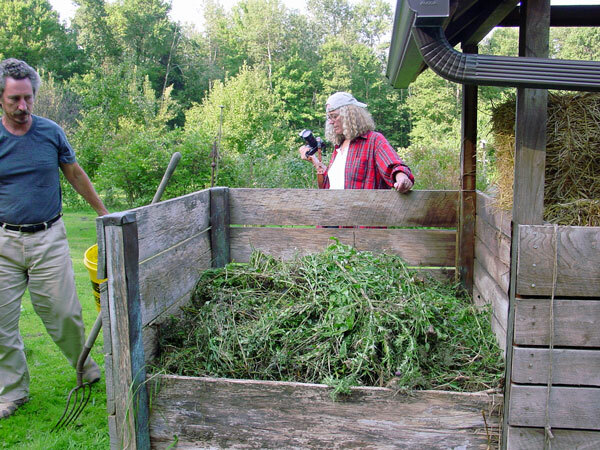 How to start a compost pile. 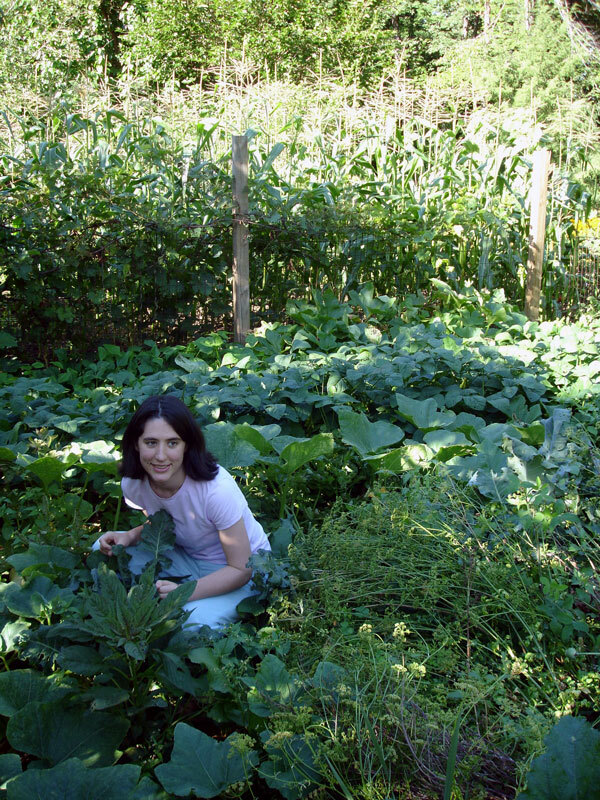 ALL organic materials (food scraps, fats, oils, meat, HUMANURE, grass clippings, garden weeds, etc.) go into the pile and are thoroughly covered with a clean cover material (in this case, straw and rotted leaves). 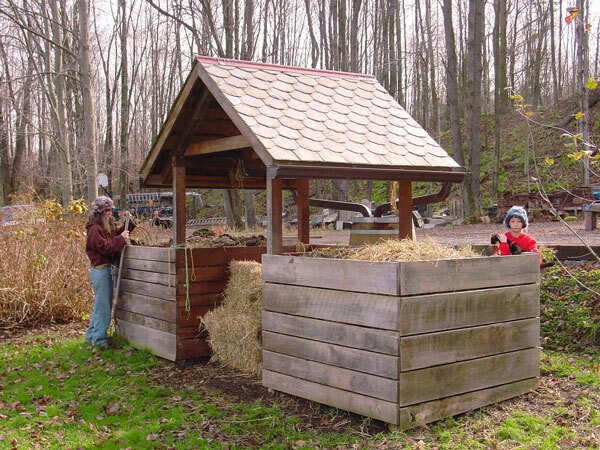 More elaborate compost bins can be built, such as the author's "Humanure Hacienda" (above and below) with a roof over the center bin to keep the excess cover material dry and to collect rain water. convenient cleaning of the compost receptacle after emptying. 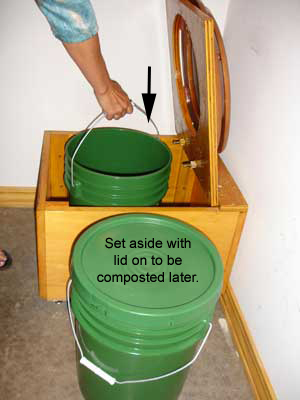 The toilet receptacle is emptied into the compost bin. 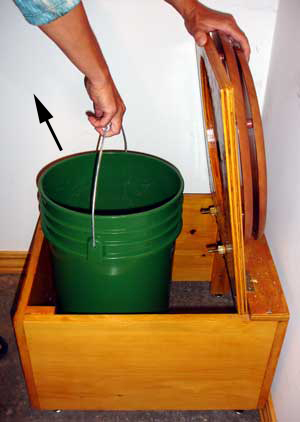 Note that a depression has been dug into the top center of the bin contents with a pitchfork prior to emptying the receptacle. 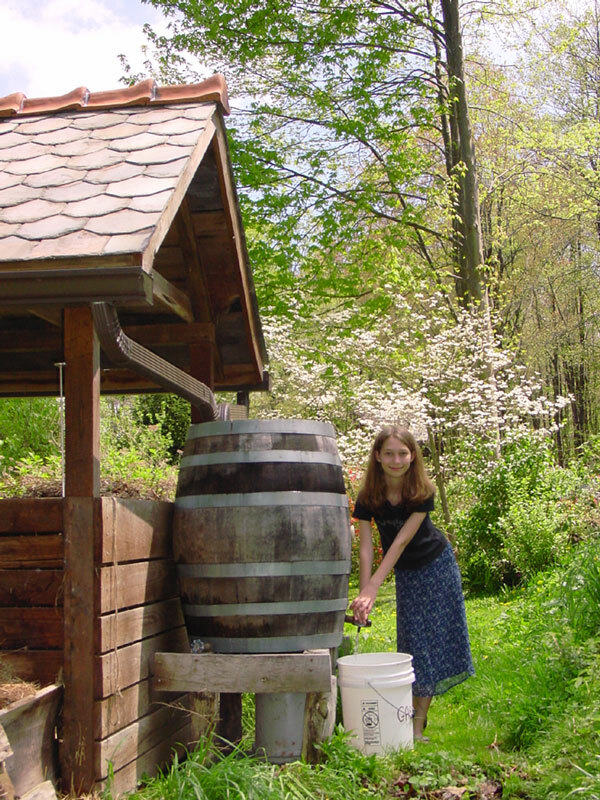 This prevents splash-back and runoff and makes it easier to keep the fresh material localized in the hot area of the compost pile. The fresh compost material has now been completely covered, in this case with weeds from the author's garden. Much of the cover material was simply raked back over the fresh deposit after the depression was dug and the material dumped into the bin. A compost thermometer is kept in the pile to monitor it's microbial activity. 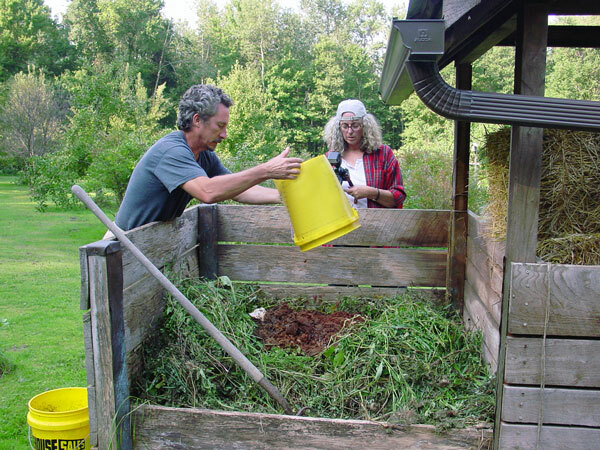 The receptacle is rinsed, scrubbed with a long handled toilet brush and a little dish soap, then the wash water is poured onto the compost pile. One gallon will wash two five-gallon receptacles. Look at some owner-built humanure compost bins. 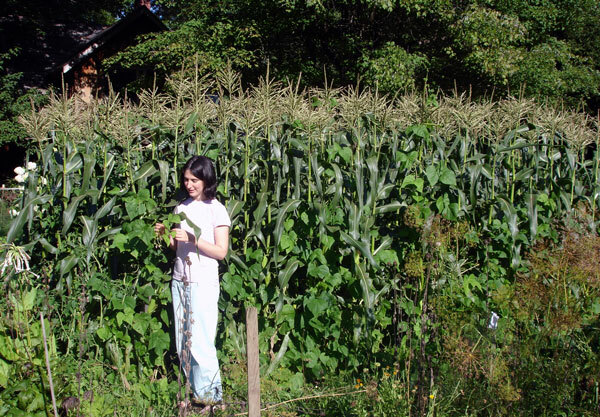 The above photos, taken in 2007 after 28 years of humanure compost, are of the author's garden. 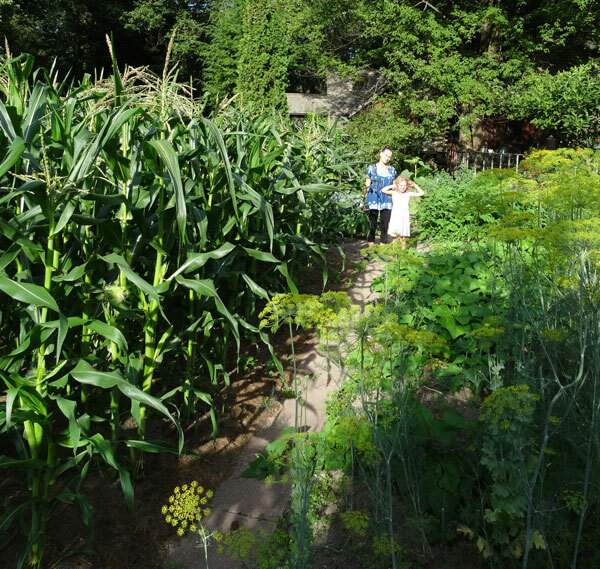 If you are a humanure composter and want to share your garden photos and humanure composting experiences with us, please visit our message board.